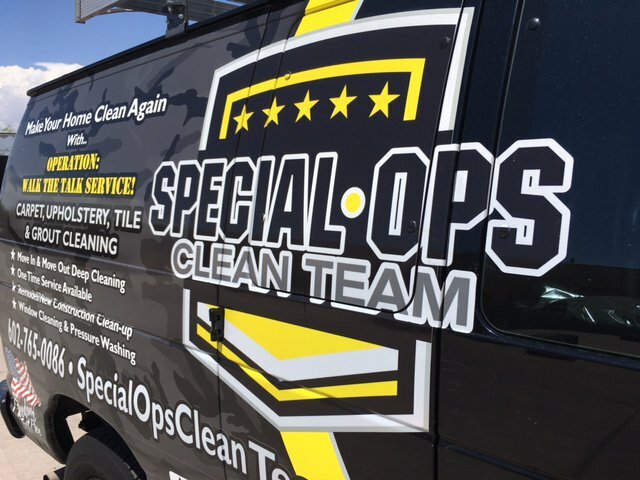 As a reputable industry leader, Special Ops Clean Team is comprised of insured, licensed, and bonded cleaning professionals with proven experience and trustworthy credentials. We are expertly trained in high quality and intricate detail for interior and exterior deep cleaning for occupied, vacant, foreclosed, or newly listed homes for sale on the market, move-ins and move-outs, new construction, remodels, and special occasions. Our deep cleaning services are exceptionally unique because unlike many other cleaning companies, we are skilled in window washing, steam cleaning carpet and furniture upholstery including tile and grout, pressure washing outdoor surfaces, landscape clean-ups for front and back yards, hauling off debris, and bulk trash removal. We have eliminated the daunting task of Valley residents having to call a number of different cleaning companies to get every type of job done because one call to Special Ops Clean Team does it all! Tim Lee is a native of Lincoln, Nebraska and an accomplished entrepreneur of three successful companies in the Valley. Tim comes from a military family, who taught him a strong work ethic, drive for excellence, and dedicated discipline. Tim has been working since he was 10 years old, graduated from Doane College with a business degree, and later moved to the Phoenix area. In 1995, Tim founded The Perfectionist Home Services, a residential and commercial cleaning company providing routine weekly, bi-weekly, and monthly cleaning service. In 2001, Tim also founded The Perfectionist Moving Services to meet the demands of existing clients needing help with local and long distance moves throughout the country. In 2012, Tim re-branded the moving company to Moving Team Six adding his two sons, JT and Garrett, as co-owners. In 2013, Tim founded his latest business endeavor, Special Ops Clean Team, a deep cleaning company servicing residential and commercial properties with specialized in-depth and expanded cleaning services for home sale listings, construction and remodel clean-ups, move-ins and move-outs, and special occasions. Today, Tim has successfully created an unparalleled niche of professional cleaning and moving services in the Valley that excels in customer service, attention to detail, trusted relationships, client referrals, and retention. Tim is also dedicated to community service doing Cleaning for a Reason for Cancer Patients while contributing to worthwhile charitable organizations such as Love House Kids Program and Wounded Warriors. He enjoys volunteering and spending time with his wife, Shelley, and three kids, JT, Garrett, and MacKenzie. Special Ops is comprised of a team of licensed, insured, and bonded cleaning professionals. Each of our cleaning professionals possess the industry knowledge and cleaning expertise that surpasses other cleaning services in the Valley. Contrary to other cleaning companies, we never bait and switch by using contractors or outside vendors to clean your residential or commercial property. Special Ops Clean Team guarantees you the peace of mind that highly skilled and trusted cleaning professionals are servicing your home or business all the time. Our staff is properly screened, outfitted with company uniforms, and has the special skill set to exceed customer expectations. Special Ops Clean Team’s High 5 Performance Program rates each cleaning professional on a daily basis making them accountable for their performance on every job. Our passion, integrity, quality work, and great attitude have earned us a solid reputation that consistently satisfies customers and ensures us repeat business. This maintains our high quality and reasonable prices while superseding the competition. We love what we do and we do it exceptionally! Simply put, Special Ops Clean Team is the best of the best deep cleaning services in the Valley. Contact us today to learn more!